Composting is an easy way to recycle kitchen and garden waste that would otherwise be put in the bin and end up in landfill sites. An added bonus is that the compost produced can improve the quality of soil and help make gardens flourish. It's easy to do and cheap. Many local authorities offer residents compost bins at reduced prices, so the initial outlay can be under £10. Ideally, a compost bin should be placed on level, well-drained soil, making it easy for microbes, worms and insects to access the rotting material. It will also aid drainage and aeration, both key ingredients for successful composting. A mixture of 'green' and 'brown' waste should be put in the bin. Greens include vegetable peelings, teabags, fruit waste and grass cuttings, while browns include egg cartons, fallen leaves and scrunched up newspaper. Adding crushed eggshells provides useful minerals. It is just as important to know what not to put in compost bins, and meat, dairy products, cooked vegetables, dog waste, cat litter and nappies are all unsuitable. It is also best to avoid composting perennial weeds and weeds with seed heads. 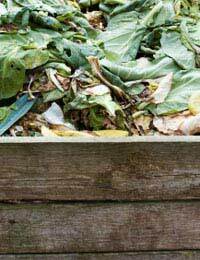 The composting process starts when microbes begin to eat the greens. This generates heat, which attracts more microbes, and mould will start to appear. The bin contents are then broken down further by mini-beasts such as worms, ants, woodlice, fruit flies and other insects. These mini-beasts need oxygen, so plunging a fork or broom handle deep into the bin to create air pockets can speed up the composting process. Within a few months, the various organisms in the bin will have broken down the greens, leaving only browns. As the temperature in the bin drops, fungus and creatures such as slugs, beetles, millipedes and snails take over. Brandling worms, which are bright red, will make their way to the top of the bin for freshly added greens, aerating the soil as they go. After nine to 12 months, the kitchen and garden waste will have been turned into compost. It should be a spongy, dark brown in colour, slightly moist and smell earthy. It can be used as a mulch or lawn dressing, or as a fertiliser for plants, flowers and vegetables. Homemade compost may not look exactly like the compost bought at garden centres. It may have twigs and eggshells in it and be a bit lumpy, but it will be as effective. Good compost can help suppress plant diseases, manage moisture levels, modify and stabilise pH, improve soil structure and provide important growth nutrients. A common mistake made by beginners is to overload the compost bin with greens, such as grass cuttings and vegetable peelings, and forget about the browns. The result is a stinky, sludgy mess and the only way to resolve it is to empty the bin, break up any solid clumps and then refill the bin, adding plenty of browns and fresh greens. It's often in the autumn, when leaves are falling from trees, that bins are filled with too many browns. The leaves will eventually break down, but without enough greens in the mix it will take much longer. Leaf mould typically takes two years before it's ready to use, so people with lots of leaves should compost them separately. If there are too many leaves in the compost bin, adding worms and fungi can help break them down.